MOWCAP was well represented at the first UNESCO Memory of the World Inter-regional Conference on Preservation and Accessibility of Documentary Heritage. 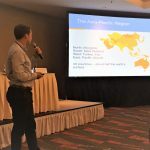 The conference was held in Panama City from 25-26 October 2018. One of the objectives was to foster co-operation among the members of the MoW community. This objective and others were all achieved in the dynamic two days of sharing MoW experiences. The conference programme can be found here. The opening remarks were made by Lidia Brito, Regional Director, UNESCO Montevideo; Luis Oporto, Chairperson of MOWLAC and H. E. Mr Flavio Mendez, Ambassador, Permanent Delegate of Panama to UNESCO. This was followed by two days of sharing Memory of the World experiences and challenges from around the world. The following is a brief report on the contribution made by the MOWCAP representatives. It also includes an update on the international Memory of the World Review. Andrew Henderson, the MOWCAP secretary-general, spoke about the work that MOWCAP has done in the region to develop implementation plans for the UNESCO Recommendation. He informed the audience that the Recommendation had been translated into many languages including Lao, Chinese, Tetum, Farsi, Thai, Japanese and Myanmar. More information on the implementation of the Recommendation is available on the MOWCAP website. Mr Henderson also showed the audience a booklet that had been developed by the UNESCO Bangkok office which provided information on why the Recommendation was important, provided an overview of the five Recommendation components and provided case studies from the MOWCAP region. Other speakers covered the implementation of the Recommendation in Africa, Europe and the GCC (Gulf Cooperation Council) countries. Dr Fackson Banda the Programme Specialist for MoW informed the participants that an online questionnaire had been developed to be used as the reporting mechanism for Member States on their progress with implementing the Recommendation. Mr KIM Kwibae, the Chairperson of MOWCAP, gave an overview of the MOWCAP Programme. His presentation included information on the strategic partnership with the Asia Culture Centre in Gwangju, Republic of Korea. He noted that value of the partnership as it provides financial and human resource support to MOWCAP for activities, projects, office functions etc. 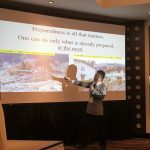 Professor Mitsuru Haga, a Vice-Chairperson of MOWCAP, gave a presentation on “Preserving Documentary Heritage in Tsunami-hit Japan: Lessons Learned”. He pointed out that “Preparedness is all that matters. One can only do what is already prepared at the most”. Another speaker Dr Dietrich Schüller, Chairperson of the Austrian MoW National Committee, gave a status report on the “The Magnetic Tape Alert Project” He informed the audience that it would soon be too late to copy video tapes to digital media because the technology to play video tapes was fast disappearing. A survey was currently being prepared to provide information on the size of this problem. Dianne Macaskill, Vice Chairperson of MOWCAP, spoke about the MOWCAP Communications Programme. The MOWCAP area is geographically and contains three of the four most populous countries in the world. She noted that the communications programme was important to keep everyone in touch with MOWCAP activities. The MOWCAP website is the lynch pin of the communications programme and provides comprehensive information about MOWCAP. Other communication channels are also used. These are Facebook, publications of coffee table books and brochures, newsletters, exhibitions, a YouTube channel and Instagram. 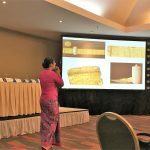 Ms Aye Mi Sein, Deputy Director, National Museum, Myanmar, spoke about strategies for successful nominations to the Regional and International MoW Registers. Myanmar is still developing its MoW Programme and so this talk was of significant interest to those who wished to successfully establish Memory of the World Programmes in their countries. At the end of the conference Dr Fackson Banda gave an update on the international review of the MoW Programme and its implications for Regional and National Memory of the World Committees. He spoke about the recent Executive Board decision to endorse the proposed updated action plan for the Memory of the World Programme and noted that the EXB decision included further consultation with all Member States and their designated experts. The further consultation involved undertaking a survey of Member States on the documents produced by the IAC and the organisation of a meeting that would involve both Member States and their designated expert. He noted that the updated action plan had proposed a working group of 3 members from each region. However, the Executive Board had decided that the working group would be open ended. The review outcome is expected to be finalised at the October 2019 Executive Board meeting. 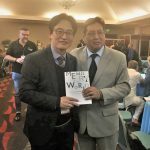 After the meeting Mr Kwibae KIM presented Mr Luis Oporto with a copy of the MOWCAP coffee table book that was published to celebrate 20 years of MOWCAP. The MOWCAP representatives thank UNESCO and the organisers for supporting their attendance at the conference.